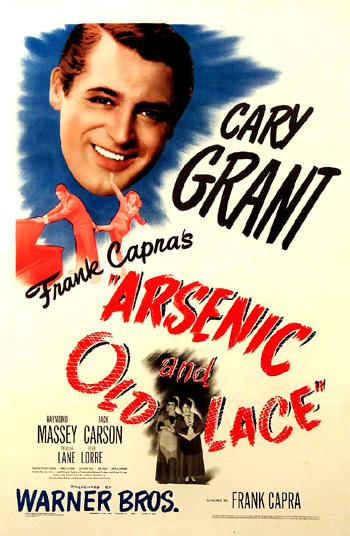 Arsenic and Old Lace (1944) is a frenzied, hilarious, madcap black comedy from celebrated director Frank Capra. The slapstick film, with murderous aunts compassionately serving up elderberry wine to elderly gentlemen - with their crazy nephew assisting by burying the unfortunate victims, is unlike most of the other reform-minded Capra-corn films with a social conscience that became his trademark, e.g., Mr. Deeds Goes to Town (1936), Meet John Doe (1941), or Mr. Smith Goes to Washington (1939). It is more similar in tone to his screwball romantic comedy It Happened One Night (1934) and to Capra's other adaptation from a Broadway play You Can't Take It With You (1938). Cary Grant does a marvelous job of exaggerated acting with constant mugging and other facial plasticity, amazing double-takes, slapstick and general befuddlement. This macabre comedy film was un-nominated for Academy Awards. The film's screenplay was written by Julius J. Epstein and Philip G. Epstein. The macabre farce was based on Joseph Kesselring's successful Broadway play of the same name, and delayed in its exhibition and release for three years until the New York play ended its run. [Note: The film's opening was on September 23, 1944.] The original cast stars of the Kesselring play, Jean Adair, Josephine Hull, and John Alexander, were released for a short while (for four weeks, the duration of the film shoot) to reprise their roles in the film, and joined established stars - such as Cary Grant. A riotous fist-fight erupts during a baseball game between the Brooklyn Dodgers and the New York Yankees at Ebbetts Field. The film comments upon the unruly and foreign nature of the town of Brooklyn with the next title card: "While at the same time across the river in the UNITED STATES PROPER, there was romance in the air." Mortimer: Yeah, yeah, yeah, I know that bromide. Something borrowed and something blue, old, new. Rice and old shoes, carry you over the threshold, Niagara Falls, all the silly tripe I've made fun of for years. Is this what I've come to? I can't go through with it. I won't marry you - and that's that! Elaine: (adoringly and softly) Yes, Mortimer. Mortimer: What do you mean, "Yes, Mortimer"? Aren't you insulted? Aren't you gonna cry? Aren't you gonna make a scene? Mortimer: And don't "No, Mortimer" me, either! Don't, don't you see, marriage is a superstition, it - it's old-fashioned, it's - I - I - Ohhh. He succumbs to her wide-eyed innocence, kisses her, and then drags her back into the license bureau to be quickly and secretly hitched together. They're two of the dearest, sweetest, kindest old ladies that ever walked the earth. They're out of this world...They're like pressed rose leaves...Their old man left them fixed for life..
No man with this published attitude on marriage should take any man's daughter any place at any time. Teddy: I must be catching cold. Abby: No dear, it was Reverend Harper who sneezed. Reverend Harper: Have you ever tried to persuade him that he wasn't Teddy Roosevelt? Martha: Oh, he's so happy being Teddy Roosevelt. Abby: Oh, do you remember, Martha, once a long time ago, we thought if he'd be George Washington, it might be a change for him, and we suggested it. Martha: And do you know what happened? He just stayed under his bed for days and wouldn't be anybody. The Aunts assure the Reverend that Mortimer has made arrangements for Teddy to be institutionalized in the Happydale Sanitarium after their passing. Elaine: But Mortimer, you're going to love me for my mind, too? Mortimer: One thing at a time. To celebrate the news of Mortimer's marriage, his thrilled, match-making aunts (who had long ago predicted he would tie the knot) propose opening a bottle of wine, singing, inviting over a few of the neighbors, and having some wedding cake. He inquires about the whereabouts of the notes for his new anti-marriage book, Mind over Matrimony that Abby had hidden from him. While searching for his papers, Mortimer opens up the window seat where he stumbles upon and discovers the results of his spinster aunts' latest charity act - a dead body. In one of the film's classic scenes, a flabbergasted Mortimer does multiple double-takes and eyeball rolls. He wrongly believes that Teddy, who is happily digging in the cellar (thinking he is digging locks for the Panama Canal), is responsible, and is determined to get him promptly committed in the Happydale Sanitarium: "Teddy's got to go to Happydale now, at once!" Mortimer: But there's a body in the window seat! Abby: Yes, dear. We know. Abby: Now Mortimer, you just forget about it. Forget you ever saw the gentleman. When Mortimer insists that they must do something, Abby reprimands him for acting crazy: "Now Mortimer, you behave. You're too old to be flying off the handle like this." But he continues to argue with them: "He's dead and you can't leave him in there." He is astounded when they tell him that Panama Canal-building Teddy assists them in digging graves and conducting proper and "decent" Christian ceremonies and burials in the cellar graveyard for the "yellow fever" victims that must be buried immediately to prevent contagion - and that their latest victim "makes twelve...just an even dozen." Mortimer: Oh, Elaine, I'm so sorry but something happened. Mortimer: Whoa, no, stop. Don't whistle in my ear, please. Elaine: Mortimer, what is wrong? Look at your hair. Martha: Mortimer, ah, ah, ah, ah! Mortimer: Darling, don't 'ah, ah, ah, ah.' I'm nervous now. Don't do that. Mortimer: Oh! (He exhales and looks over at the gentleman about to sip the wine.) (screaming) Iiiiaaaaaoooo! (He points accusingly and chases the old man out the front door.) Get out of here. Do you want to be poisoned? Do you want to be murdered? Do you want to be killed? Do ya? (He pratfalls over a living room chair) (To his dismayed aunts in a scolding tone) Look, you can't do things like that. Now I don't know how I can explain this to you, but it's not only against the law. It's wrong! It's not a nice thing to do. People wouldn't understand. He wouldn't understand. What I mean is, well, this is developing into a very bad habit. Mortimer discusses committing Teddy at Happydale with the head of the insane asylum, Mr. Witherspoon (Edward Everett Horton), but he is reluctant to accept the schizophrenic patient: "We have several Theodore Roosevelts at the moment and it would lead to trouble. Oh trouble, oh. Now if he thought that, uh, well, Mr. Brewster, we're a bit short of Napoleons at present, Bonaparte..." When Mortimer leaves to draw up commitment papers with the Judge, he urges his "darling" sisters: "Don't do anything," and vainly instructs them to not let anyone into the house. The manic lunacy is enhanced by the stealthy, nocturnal arrival of additional crazy characters on-the-run. Their shadowy silhouettes appear at the front door: a short, demented, round-eye-balled and disreputable plastic surgeon "Doctor" Herman Einstein (Peter Lorre), and Mortimer's other long-lost brother - a tall, insane, murderous, cold-blooded, sadistic killer named Jonathan (Raymond Massey). Jonathan recognizes "the home of my youth," returning as a "prodigal" son after twenty years. He bears a striking resemblance to "Boris Karloff" (and the monster in the horror film Frankenstein (1931)) [Karloff originated the homicidal role on stage, but wasn't released to star in the film, so Massey was 'made up' to look like him], due to a previous bungled, face-scarring third operation (in a period of five years) while the careless Einstein was drunk: "That last face - I saw that picture too just before I operated. I was intoxicated." Jonathan is frequently angered when reminded of the hideous resemblance that the doctor's "work" created. They have come for refuge to the respectable Brewster house since it will be the perfect quiet hideout for them while eluding police. They need to find time for another face-changing operation ("this time, I want the face of an absolute non-entity"), and to dispose of the "hot stiff" body of 'Mr. Spinalzo' in their car's rumble seat - he was killed because of Jonathan's murderous reaction: "He said I looked like Boris Karloff." Jonathan: I'm Woodrow Wilson. Go to bed. Teddy: No, you're not Wilson, but your face is familiar. Let me see. You're not anyone I know now. Perhaps later on my hunting trip to Africa. Yes, you look like someone I might meet in the jungle. The two aunts consider the intimidating Jonathan (and his companion) a terrifying menace ("This is not your home, and I'm afraid you can't stay here"), but cannot convince them to leave. After witnessing Teddy's digging of a body-sized hole ("just the right size") in the basement (in Panama), Jonathan and the doctor plan to bring their corpse into the house later that night. After they move their car next to the house (outside the window), Jonathan shocks his two aunts by bursting through the open window above the window seat and announcing: "We're bringing the luggage through here." When the lights are turned out and everyone is forced to retreat to their upstairs rooms, Teddy carries the new "yellow fever victim" Mr. Hoskins from the window seat down to the cellar ("canal") for burial, according to a pre-arranged plan with his aunts. Then in the dark, Einstein and Jonathan sneak downstairs and clumsily haul the body of Mr. Spinalzo into the house (and hide him in the window seat) when Elaine unexpectedly arrives searching for Mortimer. They suspect that she is a "dangerous" witness - they threaten her, gag and half-strangle her, and drag her into the cellar. We were married today. We were going over Niagara Falls in a barrel. Your brother tries to strangle me. A taxi is waiting, and now you want to sleep on a window seat...You can take your honeymoon, your wedding ring, your taxi, your window seat, and put 'em in a barrel and push 'em all over Niagara Falls!